Years ago I delivered a Friday morning keynote to an all-men business meeting that took place at a conference centre (which doubled as a banquet facility, evenings and weekends). As such, the wooden floor was highly polished and ready for dancing feet later that night. After being introduced I, too, slipped and stumbled, but had no Jennifer Garner-style excuse, nor luck! 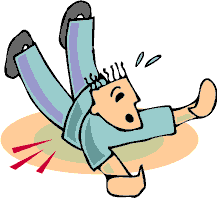 I fell–plunk–right on my behind! With quick thinking, I exclaimed, “Well that’s the first time I’ve fallen for so many men at one time!” My daughter still maintains that was a pretty cheesy line, but my audience loved it! It helped me save face and, quite frankly, helped advance my bond with the group. Has anything like this ever happened to you? In which situations at work do you wish you were able to think quicker on your feet (or on your behind, as it were)? When have you, “fallen down, gone boom”, on the job–literally or metaphorically–and wished you were quicker with words or actions to patch things up, or smooth things over, to save face or maybe save even more than that? 1. Practice Anticipation: Learn the skill of seeing–envisioning–things before they happen, just as a mother would see the glass of milk too close to the edge of the table and push it in, or just as you would in a chess game. As a matter of fact, learning to play chess–or dusting off your set and playing more chess (or any other game requiring plot and strategy many moves ahead, eg. Backgammon, Scrabble, etc. )–is great practice for sharpening your thinking and anticipating possible events, issues and problems at work. A more concrete and corporate way to develop this skill may include a time slot in your team meetings whereby each member thinks up scenarios requiring resolution, eg. what would happen if…what would we do if… . The team’s job is to practice answering those “what if” challenges with quick thought. An added twist could include responding as one would through the eyes of different people and positions, eg. external stakeholders’ or clients’ perspectives. This philosophy has served me well for spotting trends, both professionally and personally, through the years. Thinking sharply–sufficiently enough to spot trends while still in their infancy–may very well save both yourself and your organization lots of time, money and increase productivity. 3. Champion a Creative Workplace Environment, both physically and emotionally: What has to happen to make your workplace more creative–more open to lateral thinking? 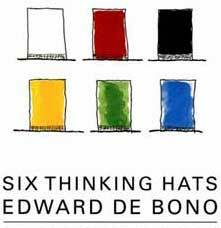 One classic strategy for opening up to flex-thinking is to practice Edward Dubono’s, Six Thinking Hats. The Six Thinking Hats approach to resolving workplace dilemmas, problems and issues offers a strategy for seeing the “problem” from different perspectives. Put on a black hat for a critical viewpoint or a yellow one for sunny optimism. A green hat brings a wealth of creative ideas. Try white for neutrality and red for emotions. And then, once you’ve generated a whole range of solutions, sort them out–a blue hat will give you that detached overview. The results prove amazingly effective. 4. Clear Your Clutter: Trust me, I’m a student of this one for life (rather than an expert who always demonstrates this principle to perfection). Isn’t everyone? It’s spring. Use the excuse of this time of year to clean up your physical clutter, eg. messes on your desk, at your workstation, in your email folders, etc. Haven’t you noticed how proud and puffed up you get when you clean up your workstation? I know I do…I want to show everyone who drops by how tidy and efficient my workspace now is! Tidying your workstation is like scraping barnacles off the hull of a boat…it helps you go faster and more efficiently through the troubled waters. Now’s a good time to do just that! 5. Embrace Pure Brainstorming in Your Team and Project Meetings: Most of us think of brainstorming as a process whereby one or more people identify a multitude of ideas for sleuthing out the best answer to an issue (shooting for quantity, not quality). To a large extent that’s exactly what effective brainstorming is all about. The trouble is this: when it comes to formal brainstorming sessions, too many times, in too many team or project committee meetings, some members feel insecure about sharing their suggestions (perhaps because of their political position within the group, years of seniority in life or within the organization, professional esteem issues, etc.). Hence, not everyone is heard. Additionally, too many times the most vocal or cocky of the group (or perhaps the most positionally senior or expert) takes more than their fair share of “airtime”. This same person may also be known to repeatedly pipe-in with comments such as, ‘No, no…that idea won’t work!” “Whatever do you mean by that?” “We tried that last year and it failed miserably!”, etc., forever shooting down budding ideas. After a few times the team member who is repeatedly shot down–in front of all their teammates, to boot–may clam-up and shut-up from that point on; thereby causing the team and the project to lose the potentially perfect solution to their problem, which was about to be organically hatched by virtue of one team member building on the “crazy”, “imperfect” or “stupid” idea of another. everyone else promises to “put a sock in it” and resist the urge to blurt out, “That’ll never work!! !”, when a team member says something they consider “out there in the Twilight Zone”. In other words, absolutely no judgment…articulated or otherwise; and the gatekeeper gets to metaphorically zap the rules violator if they do jump in with judgmental, editorial comments; to make it more fun, the gatekeeper may bring along some prop, eg. a whistle, horn, rubber chicken to twirl…whatever, to blow or swing when such a violation occurs! reach consensus on the one idea that works best for your group’s comfort, timelines, budget, political situation, etc. Sometimes you have to take time to stop and consciously think–go a bit more methodically and slowly–to go fast and “think quick”. Haven’t you ever noticed that sometimes, while driving on the highways and by-ways, the supposed “slow” lane ends up being the fastest, after all? Falling or losing your usual confident professional stride–metaphorically or literally–can temporarily slow you down and muddle your thinking, but some good can come of it. When it comes to slipping, bumbling or stumbling at work–when in the professional limelight and things don’t always go as you envisioned or choreographed–use whatever strategies you can (including these five offered up to you here), to help you come through with grace…and land back on your feet…even if you do “fall down, go boom!”, on-the-job from time-to-time. As Oprah Winfrey says, “So go ahead. Fall down. The world looks different from the ground.” And, I suggest, you just may learn some wise, worldly and professionally practical lessons from the falling down and the getting up. So think quick and get up, get up, get up — it’s spring! Rediscover and reclaim your passion for your profession! Nina’s new book, Getting Passion Out of Your Profession delivers a motivational, inspirational and content rich message that’s relevant and topical, with a great sense of humour, and in a way that gets the reader’s involvement and participants. Count on it, Nina Spencer delivers the goods!